It is rare to find someone so special and selfless that they give up their own personal freedoms and fortunes to help others. This touching story gives you not one, but two of those kind of people. 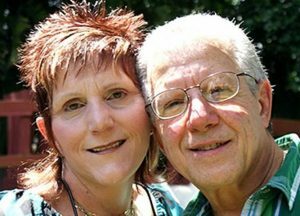 The Possible Dream Foundation began with a husband and wife couple who simply loved taking care of children. Michael, a doctor, and Camille, a nurse, worked at the same hospital where Camille could often be found reading or holding hands at the bedside of special-needs and critically-ill children abandoned by their birth parents. The Geraldis would bring children home when the hospital could do no more for them, and over four decades the couple adopted or provided long-term care for 88 children. It was their calling. After adopting 18 children and having three of their own, the family was running out of space so they bought the home next door and officially opened a nonprofit in 1986, originally called, The Up With Down Syndrome, and later changed it to the Possible Dream Foundation. These children, many of whom were expected to die within months were thriving! No longer were they defined by their Down syndrome or cerebral palsy diagnoses, they were normal children who loved to play and sing, eventually graduating high school and even training therapy dogs. The Possible Dream Foundation not only serves as a support for the cost of housing, feeding, and caring for the Geraldi children, but it also provides job training for disabled adults, education for parents in care of special-needs children, and therapeutic rehabilitation or hospice care for people with special-needs. Michael also provided pro bono medical services to many children through his pediatric practice. Over the years, Michael and Camille have been honored with many awards, including a Point of Light Award presented by President George Bush, and have been the subjects of multiple feature pieces, including spotlight on 60 Minutes. In March of 2016, a few short months Michael and Camille were to go on their first vacation to celebrate their 40th wedding anniversary, Michael passed away from mesothelioma. Life has certainly not been easy for Camille. With so much heartache and multiple setbacks including a hurricane, vandalism, and a house fire started by lightening, it would seem enough reason for anyone to stop and live a life of leisure. But that is not Camille; that is not in her character. She loves these children because they are her family and she has devoted her life to making sure they are able to live theirs. And, thankfully, with the help of many volunteers and generous contributions from donors, Camille has continued her and Michael’s legacy. You can support the Possible Dream Foundation by visiting the donate page on their website, or follow their adventures on Facebook.